I have been wondering why the Kasper/Amoris Laetitia Proposal has prompted such a deep feeling of loathing and disgust. This response has for me been at a gut level, and I have been trying to understand it. Today I think I figured it out. Many years ago, when I was studying the Faith, I came to an extraordinary realization that changed the direction of my life forever. I had already started taking seriously the moral law, but immediately began to see the admonition of Christ to “be perfect as my Father in heaven is perfect” (Mt. 5:48) as a calamity. If Jesus requires such absolute perfection from me, my chances of heavenly beatitude were slim indeed! I came close to despairing and nearly gave the whole thing up. I had come at that stage to a better understanding of my own sins, the vast and terrifying cosmic significance of opposing God, and perhaps had a faint glimmer of the immense and unimaginable perfection of God and of the utter abjectness of my own self, mired in sin, in comparison. My dim glimpse of the enormity of the perfection of God immediately rendered the task utterly inconceivable. “Be perfect” like that? Huh. Not hardly! And it seemed unjust to expect it of me, and I struggled for a long time with this apparent conundrum. How can the perfect God, who perfectly wills my perfect good, give this completely unattainable command for perfection? From my point of view, there was no solution. It was impossible to impute to God anything other than total truthfulness, but the command was absurd. 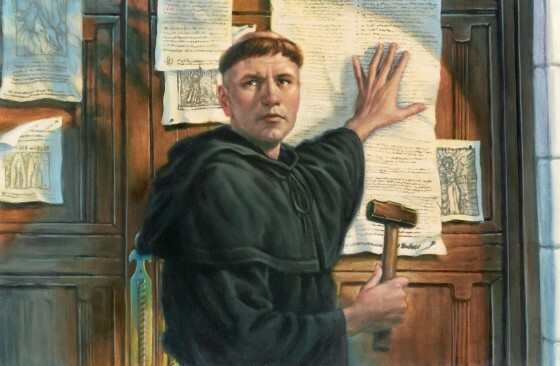 In the midst of this crisis, (that went on for more than a year,) I came across the teaching of Martin Luther and his followers, who, when confronted with the same apparently insoluble problem, issued a ruling that was, essentially, against God. Human nature was hopelessly corrupt, top to bottom and god Himself has no power to alter it. They described the human soul as a dung heap, over which the grace of God falls like a deep covering of snow, that changes nothing of the underlying corruption. This nauseating and plainly wicked doctrine – essentially nihilistic – so infuriated me that I realized in a flash that it was an insult, not to me in my failings, but to God’s infinite perfection and power. My very fury at this insult made me understand at last what the Church had always held: that it is not my power, but the power of God that will change me into this “perfect” new thing. This promise was true, and it had much more to do with Him than with me. Luther tried to say that God cannot change us into better, “perfect,” creatures, and this insult was not to be borne. God Himself not only can but wants to change me – He has said it plainly – and this end was the reason I was made. And this is why the Kasper Proposal, and Amoris Laetitia, and all the jolly works of Pope Francis to make us more worldly and less interested in our ultimate end, in the Christian yearning for the Beatific Vision, is so depressing, so dispiriting, and so disgusting. I was disgusted with Luther’s proposal that we cannot be changed mainly because it disparaged God. My desire to be an entirely different kind of thing can only be fulfilled by divine grace. And here was this hideous toad of a man telling God that this was impossible. The Kasper/Francis solution to the problem that I had when I was working this out, that nearly undid me, is the same as the Luther solution: give up. Quit. You’re right, it’s impossible, so you shouldn’t really even bother trying. They say, in essence, that God is a liar, He does not love you with a perfect and transformative love, He has no intention of changing you because He has no power to change you. Might as well set your sights lower. The great secret of the Catholic Faith is that it is intended to change you, radically, that is, root and branch, into a new thing, something the world had not seen until Christ became man and made it possible. The command to “be perfect” to that infinite degree is not intended as a condemnation or a counsel of despair – as if it could be imagined that Christ would issue such a thing. The logic of my discovery was simple and was based on the first notion that Christ was incapable of falsehood, incapable of wickedness. Therefore, everything He told us to do had to be something possible. But, knowing what I was, a sinner incapable of climbing out of the mire of my sins on my own, I understood finally that something utterly unprecedented, something completely extraordinary, was required. This is the logic that Kasper and Francis, following Luther, appear to be unwilling to face. I don’t know why they refuse to consider this simple, logical result. Perhaps they simply do not believe in God, or that God loves them, or that He has power to help. But the logic cannot be ignored: either God is a liar, or He can do what I cannot. And the answer to that is obvious. With this document, Francis is proposing that God is a liar, and instead of the Transforming Union, instead of the “divinization” and heroic sanctity in this life, and unimaginable glory forever in the next life as the intended destination for all human beings without exception, we have the message of Amoris Laetitia: from now on the Church will no longer require a person to even remain in a state of grace because such a thing is impossible, not only for us, but for God. Sins are no longer sins, repentance is no longer required and forgiveness and sanctifying grace are no longer offered from a God who does not seem to care very much about us. The religion of Kasper and Francis and “The Joy of Love” is too depressing for me. I think I’m going to carry on being Catholic. Catch Hilary's new one, "On Roman Blashemy", exclusively in the next print/e-edition of The Remnant.